July 18, 2016 | Michele Cohen, Ph.D. The Ulysses S. Grant Memorial, star of the House of Cards opening sequence, is undergoing a dramatic transformation. Unveiled in 1922, it was cared for by the National Park Service until 2011, when Congress transferred it to the Architect of the Capitol. The Ulysses S. Grant Memorial on the west side of the U.S. Capitol. Since spring 2015, this captivating monument — a labor of love by sculptor Henry Merwin Shrady — has been the focus of a meticulous conservation effort. When work on the bronze components and marble pedestals is completed this fall, viewers will again see the subtle details of the original sculpture. 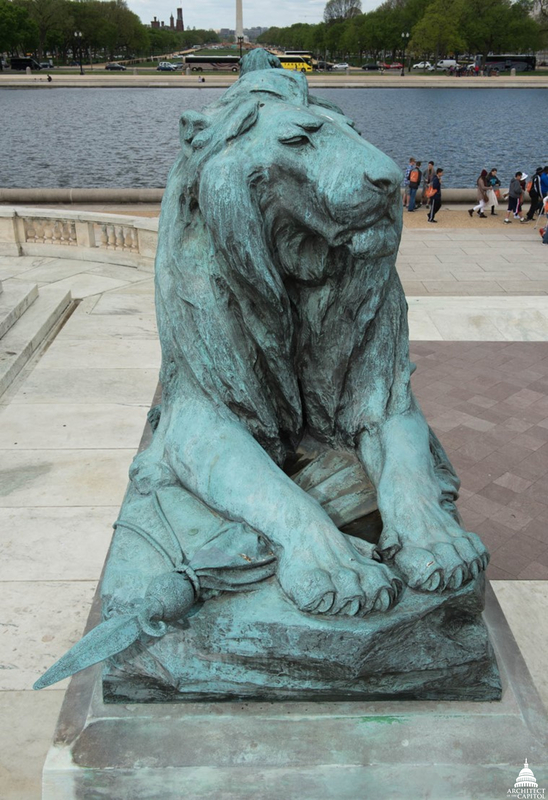 Disfiguring corrosion will be removed; over 150 castings of missing or broken pieces, from swords to chain links, will be reintegrated into the monument. The marble plinths will be refurbished, with joints repointed and stains removed. 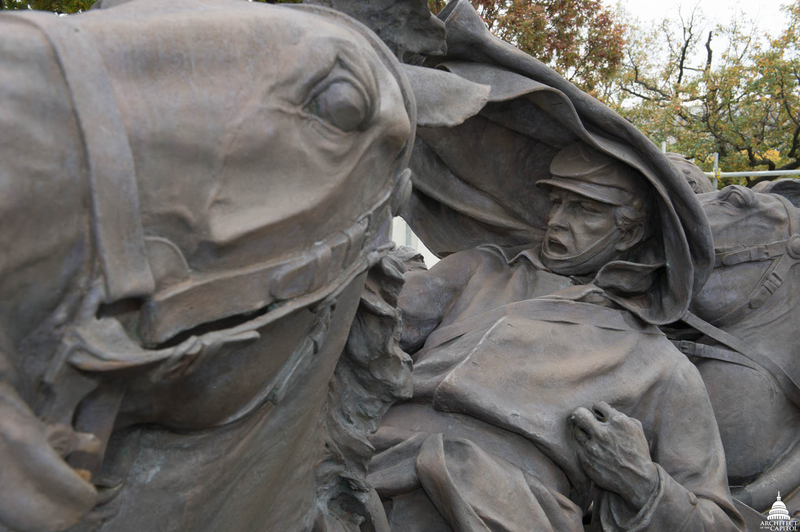 Celebrated as the largest equestrian monument in the United States, the Grant Memorial is a tour de force of monumental sculpture. It is a remarkable achievement by a sculptor who, with little formal training, toiled 20 years to translate his grand vision into cast bronze. At two and one-half times life size, the figure of Grant mounted on his horse forms the monument's apex atop a pedestal that is over 22 feet high. Four lions lie with heads erect, guarding the flags of the Army and the United States, defining an imaginary pyramid's base and visually aligning with the life-size Cavalry Group on the north and Artillery Group on the south. The monument is an essay in opposites, contrasting Grant's customary stillness while observing battles with the turbulence of the charging Cavalry and Artillery. This complex sculptural ensemble contains an enormous equestrian figure of General Grant astride his horse Cincinnati, two bas-relief panels, four lions, 12 horses and 13 soldiers. 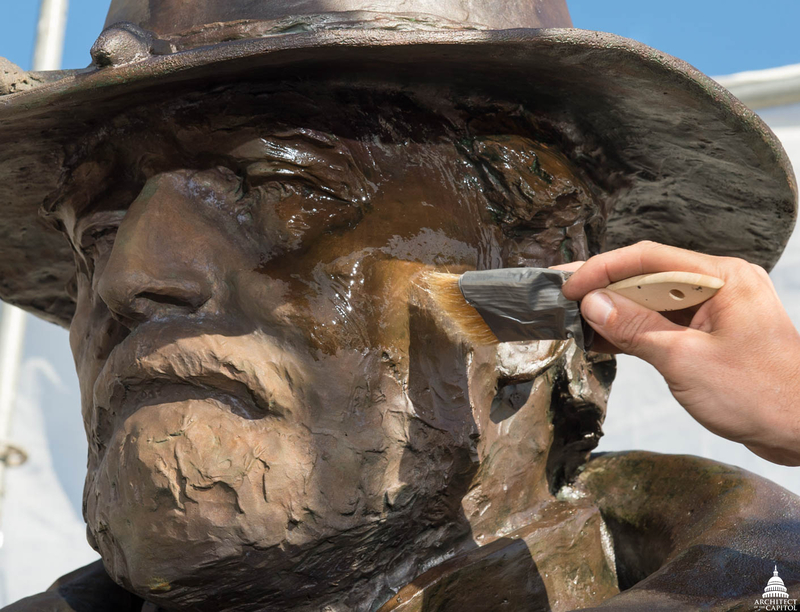 General Grant receiving the first layer of lacquer. The casting of the bronze was in itself a technical feat. When Artillery, weighing 15 tons, was finished in 1912, it was the largest bronze group ever to be cast in the United States. It required expert engineering and was assembled on site from four large sections, each consisting of multiple parts. On all aspects of the monument, Shrady worked closely with his friend, Roman Bronze Works owner Ricardo Bertelli, to create the molds and determine how to support the forms, many of which are suspended in air. 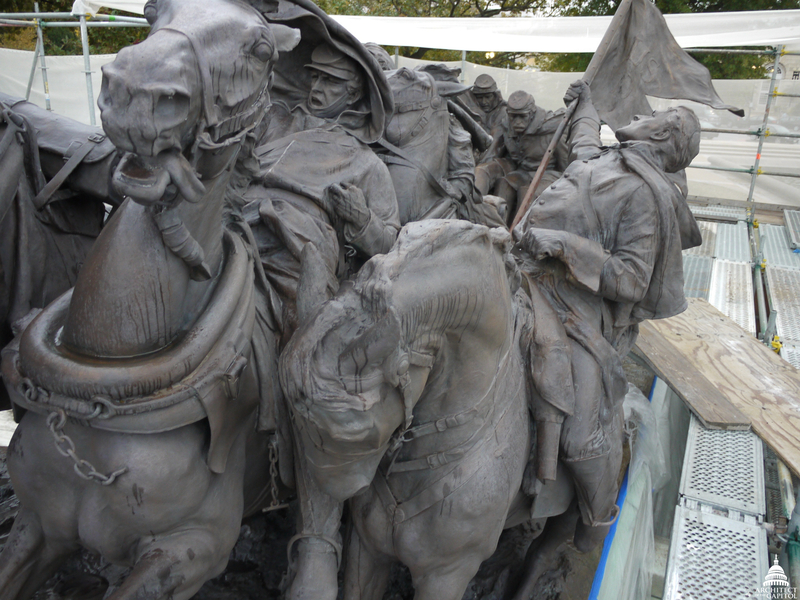 Images of Cavalry Group, left, and Artillery Group, right, currently under restoration. In the completed monument, Shrady puts us right into the action. Realistic details at eye level, including military equipment and uniforms, rocky terrain, battle debris, horse musculature, and the pained expressions of individual soldiers, endow the scene with authenticity. Shrady researched and studied each element intently, even observing specially staged cavalry and artillery drills at the United States Military Academy at West Point to ensure accuracy in the movement of the two groups. Detail of a soldier in the Artillery Group. At the beginning of the conservation project, we convened a Conservation Advisory Group of experts to evaluate different cleaning techniques, patinas and coatings. 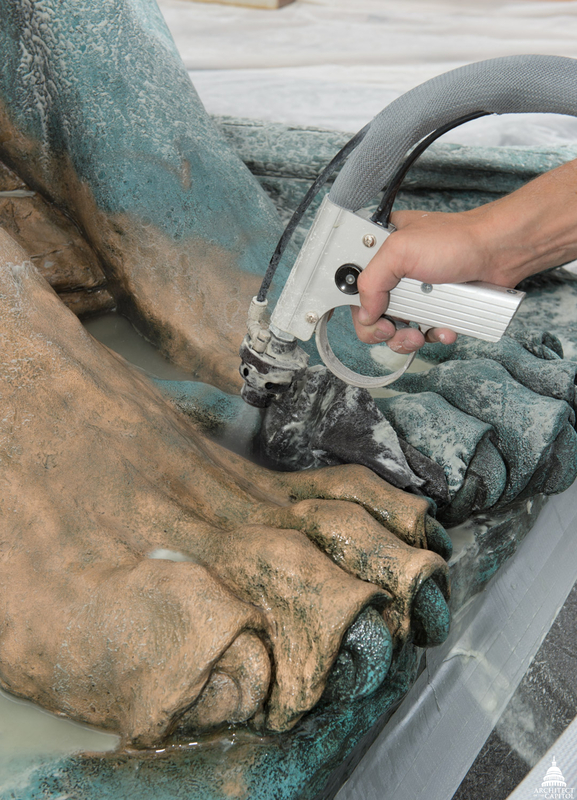 The group agreed that micro-abrasion using finely powdered calcium carbonate most effectively prepared the surface for repatination as closely as possible to Shrady's original statuary brown finish. 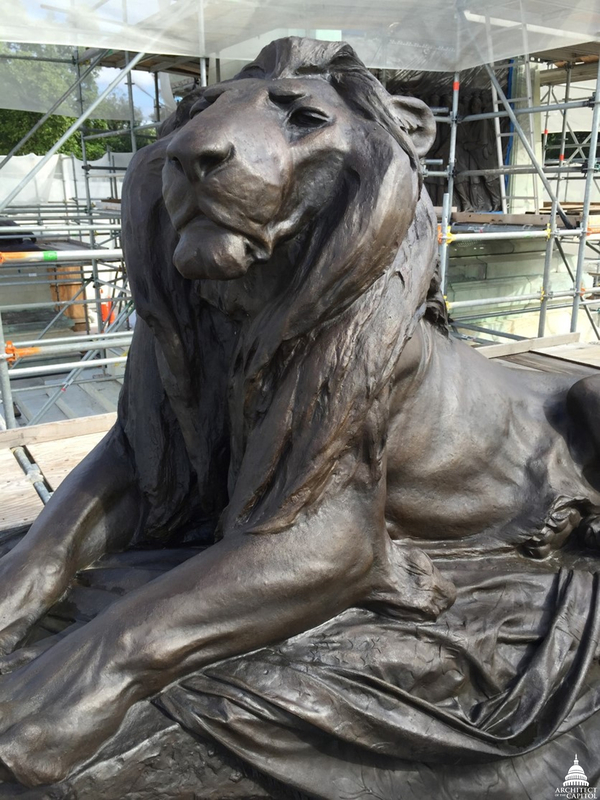 As of summer 2016, conservators have cleaned and repatinated all bronze components of the monument and applied the first lacquer layers. Photo above provides a detail of a lion's paws during the micro-abrasion process. Over the winter, a Philadelphia foundry made approximately 150 individual bronze castings of missing pieces. Multiples of similar elements were cast from the same mold and marked with the foundry stamp to distinguish them from original pieces; x-ray fluorescence analysis will also differentiate the silicon bronze alloy from the original metal. 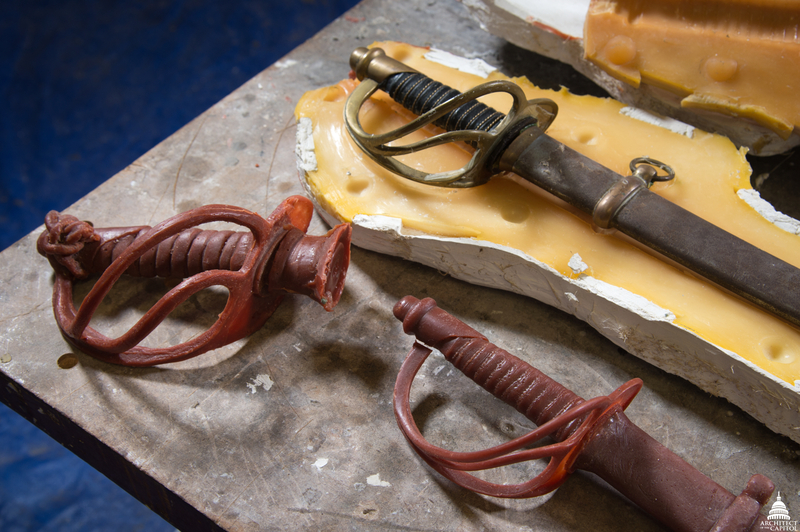 Bronze sword and mold at the foundry. A recent site visit included "dry-fitting" to see how these elements would be placed on the monument. Where possible, the original attachment method of threaded bronze rods inserted into existing holes will be used, but for some elements, welds will be necessary. In addition, based on historical photographs, major corrections have been made, such as the reversal of the pennant held aloft in Artillery. 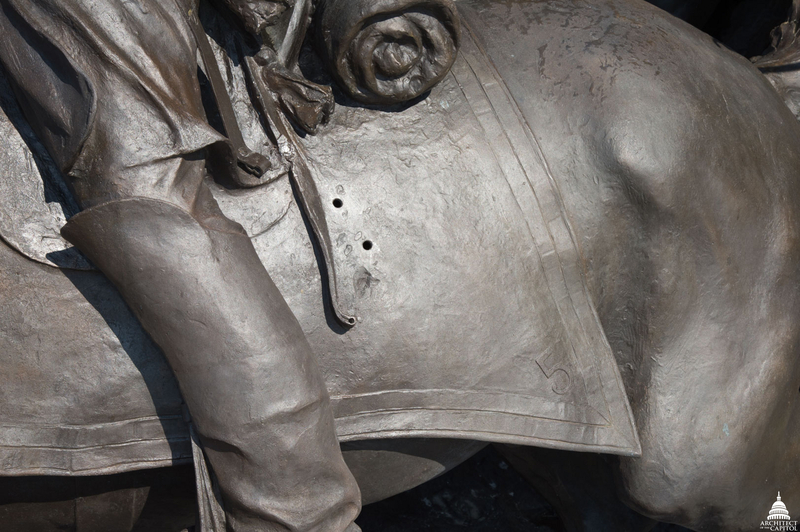 Existing holes in a Cavalry horse blanket where threaded bronze rods will be used to reattach details. As I have revisited the Grant Memorial numerous times over the last year, my admiration for both the artist who sculpted it and the foundry that cast it have grown. We hope the public will share our commitment to preserving this 20th-century masterpiece for future generations and will respect both Shrady's herculean effort and our investment to conserve and maintain it. Dr. Michele Cohen is Curator for the Architect of the Capitol. Having made multiple visits to the National Gallery of Art exhibit of Hellenistic Bronzes earlier this year, I gained an enhanced appreciation for the historical and cultural importance of such highly crafted artworks. Also, I live in the neighborhood of the USMC Memorial in Arlington, which is another monumental bronze commemorating the service and sacrifice required to preserve Liberty. 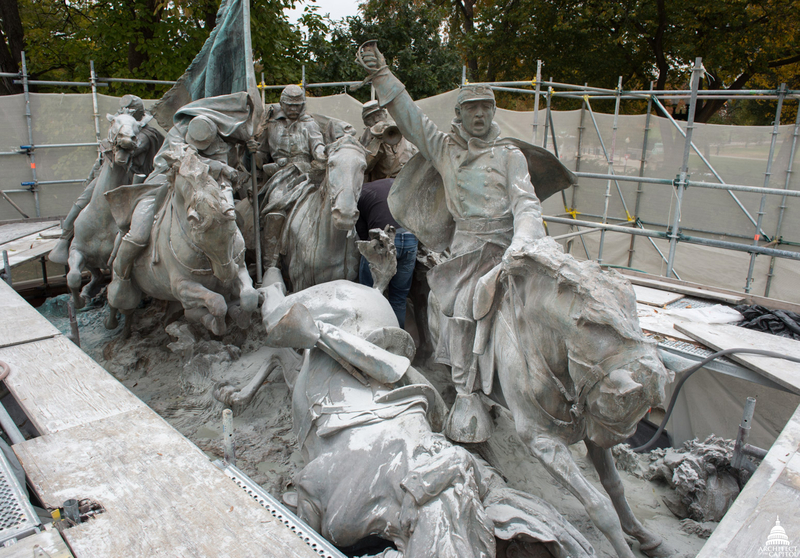 I am thrilled to learn about the restoration of the Grant Memorial statues. When I first photographed the memorial years ago, I felt so bad about the missing cavalryman's sword that I photoshopped it in. I can hardly wait to examine and photograph the finished restoration. Thank You! Bravo. So glad you are adding your great skills to the effort to restore the National Mall! I am thrilled that at this stage of my life, the winter stage, Grant's Memorial has been revealed to me. I have visited the Capitol three or four times in my lifetime and never took notice of this magnificent work. It is a worthy memorial for a great soldier and patriot. President Grant is my most favorite hero of American history. Though I was sad not to be able to see the memorial on my recent trip to DC in early September 2016, I am extremely grateful that this beautiful monument is being well taken care of. Thank you! As I have revisited the Grant Memorial numerous times over the last year, my admiration for both the artist who sculpted it and the foundry that cast it have grown.